Sometimes the most humble self-sown annual makes huge contributions to a garden and gets absolutely no credit - it's taken completely for granted, with rarely a photograph. 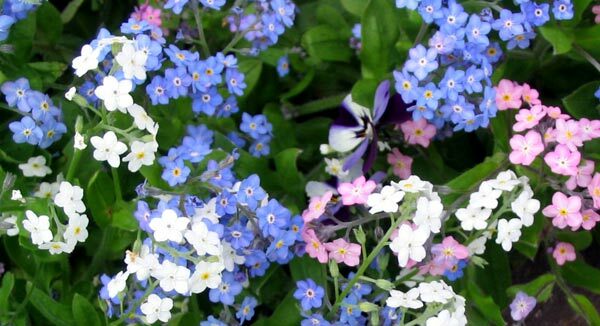 That's the yearly fate of my annual pink, blue, and white Forget-Me-Nots. These pretty flowers only get mentioned in my diaries in early summer, when I'm ripping them all out and my clothes are getting covered with their sticky seeds. And, I might add, I have to spend hours grooming my large fluffy cat, who insists on keeping me gardening company when the Forget-Me-Nots are seeding. He gets absolutely covered in biddi-bids. 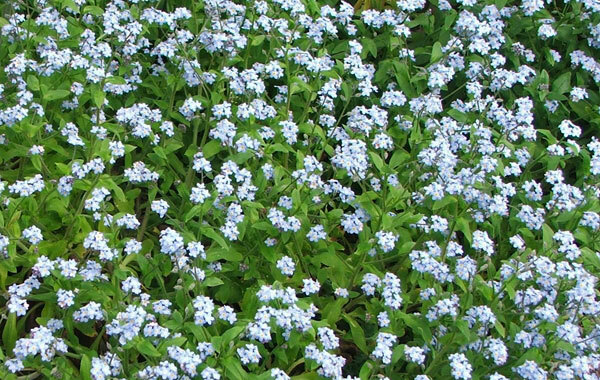 I'm sure that Forget-Me-Nots are dismissed as nuisances in many gardens - in fact I know a gardener (not a close gardening friend!) who won't allow any in her rather large garden beds. Silly woman! And fancy worrying about weeding them out - there are far worse plants that can pop into a garden uninvited. 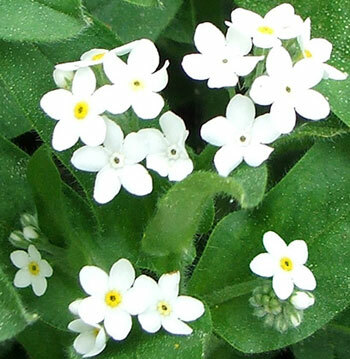 This spring my little self-sown Forget-Me-Nots have been, as usual, quite delightful. They do so well filling up the spaces between the green growth of other, more showy plants.